Marco Broccardo was an ordinary boy from an ordinary family. He had parents who loved him and older sisters who doted on their little brother. He had friends and he played sport at school. Schoolboy experimentation with weed quickly turned to coke and ecstasy. Drugs made him feel great. What was the harm? The trouble came when supply and demand were out of balance and a harmless joint and a couple of pills no longer did the trick. Marco needed cash – more and more of it. He became a runner for the dealers who operated in the clubs where Joburg teenagers went to party. He had money and he had drugs. Life seemed good. Then he discovered crack cocaine. From that moment the ruthless pursuit of his next hit took his family to the brink of financial ruin and emotional despair. Marco lied his way through rehabs and halfway houses; he used every genuine offer of help as opportunities to plan his next spectacular relapse; and he dismissed several close calls with death as signs that he just needed to be more careful next time. He didn’t care. Until the day he made the dramatic and life-altering decision to change. 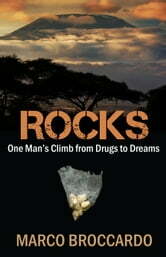 How he did it and what he has done with his life since then are nothing short of miraculous. Rocks – One Man’s Climb From Drugs to Dreams is Marco’s story.